Wire-wound metering rods, often called “Mayer rods” after their inventor, Charles Mayer, are stainless steel rods tightly wrapped with stainless steel wire. The wound wire creates a thread that is always the same profile (a half circle). Wire size is determined by the diameter of wire wrapped around the rod. Wire-wound rods are used on coating machines to apply pigments and other coatings onto various web surfaces. 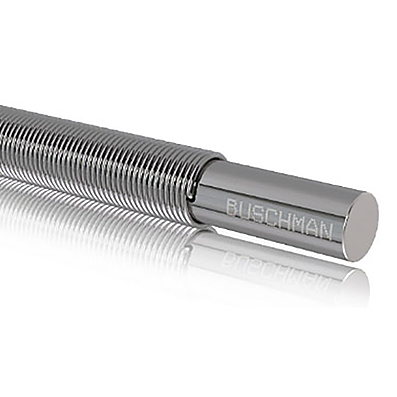 Buschman wire-wound metering rods are precision-manufactured at every step of the process. We start with the finest stainless steel rods and wrap them with stainless steel wire drawn through 100% all-natural diamond dies. The result is a rod with amazing tensile strength and precision sizing that produces a consistent, defect-free surface finish. Buschman wire-wound rods also are available with “double-wrapped” wire for higher coat weights; and gapped wire-wound rods customarily designed for high deposition coatings with higher viscosity properties. The thread profile on a metering rod can significantly affect the quality of the final coat as well as the runnability and cost of the coating operation. That’s why more and more converters are switching from wire-wound rods to grooved metering rods. Wire-wound rods and Mayer rods only offer one thread profile, while grooved rods can be made in an infinite number of thread profiles, including profiles that match the shape of wire-wound rods but without the problems associated with the pinch area between the wires. To find out if switching to grooved rods is right for your application, contact us. Our engineers will be happy to work with you to determine the right metering rod for your particular application. Why throw away rods when we can recycle them? With Buschman’s Rewrapped Rods program, your worn wire-wound rods can be reused. Simply strip the wire from worn rods and send the used rod cores to us. Buschman will rewrap the rods with new wire and send them back to you. Specialty & custom coating applications Special ends: All special ends configurations available. Buschman rod holders are precision manufactured to give the rod a more uniform and consistent fit along the entire length of the holder. Our rod holders reduce rod vibration, increase rod and holder life, and promote a more uniform coating. We manufacture rod holders from Hot Cast Polyurethane (PU) and UHMW Polyethylene (PE).